To say that it only belongs to me will be wrong. The whole working group laid the idea of the National Agency in the draft Law “On Higher Education” as early as 2012. These were difficult times, with Tabachnyk, who headed the Ministry of Education and Science in 2010 and immediately decided to carry out his own law “On Higher Education”. The situation was extremely unfavorable, but in November 2010 the Kyiv-Mohyla Academy expressed public disagreement with the so-called ministerial bill. Later, the general public, through the all-Ukrainian actions in the framework of the Anti-Tabachnyk campaign and the campaign “Against Education Degradation”, managed to stop it. The problem was that Dmytro Tabachnyk wanted to introduce the Russian management principle in the Ukrainian system of higher education. Is it about the so-called strong power vertical? Yes, from the President of Ukraine to the Minister of Education, then personally to each rector, and no university autonomy. We, at the Kyiv-Mohyla Academy, believed that this would have concreted all relationships in higher education for at least ten years. In fact, it was a law that regulated the many powers of the Ministry of Education and Science at the expense of the restriction of already illusory rights of higher educational institutions. However, mass protests against the activities of Tabachnyk began in Ukraine. On this extremely negative political background for the then Government, a special Government decision has created a working group that was to develop a law on higher education “from the academic community”. At the same time, the draft law “from political opposition” was developing. In fact, both groups worked along the same conceptual path. Who were members of this working group? Quite a lot of people, who gathered at the Kyiv Polytechnic regularly. Mostly they were representatives from different stakeholders: universities, academies of sciences, students, trade unions, employers and others. We then considered about 4 thousand proposals that came in different ways, including post and e-mail. That is, the creation of the bill was a very open and democratic process. As for the concept of the Agency for Higher Education Quality Assurance, we borrowed this idea from Western European practice. An important principle of its work is professional independence, in particular from the Ministry of Education and Science of Ukraine. However, before 2013, the opposite processes of concentration of all powers in one hand took place in Ukraine. The Higher Attestation Commission actually became a department of the Ministry. Even in Stalin’s time, HAC was institutionally more independent.Finally, it started to work… What will you do? We will be engaged in the accreditation of educational programs, institutional accreditation of higher educational institutions (HEI), accreditation of dissertation defense councils, as well as accreditation of other agencies, which, in turn, will also be engaged in accreditation. As you can see, accreditation is the major direction of our work. Yes, our responsibility also includes adherence to academic virtues, the creation of criteria for the quality of educational activities, the introduction of an internal quality assurance system for education, the formation of various legislative proposals, the creation of university ratings, the preparation of an annual report on the state of higher education in Ukraine according to the main objectives of social development, etc. Can you specify the experience of which particular country was the most useful? Perhaps, the UK and continental European countries, including the former “socialist camp”. Our goal is not only to check educational programs for compliance with higher education standards but also to assist in the development of the HEI, to provide peculiar consulting services, dialogue and cooperation with the educational environment. Of course, we are talking about cooperation with those universities that will be interested in such cooperation. Is the range of these services already known? First of all, we want to completely abandon paperwork. Now, this is a very bureaucratic system, and people, who live in different cities, have to carry suitcases and packages with folders of papers back and forth several times. For example, they prepared a package of documents, brought it, and some error or inaccuracy was found in it. And they have to correct it, and then bring these documents again. And it can be so several times. Unfortunately, they often do not have enough information on how the accreditation documents should be prepared. When the time of the accreditation of some educational program is appropriate, the HEI will inform us about this. The fact is that sometimes the program can work without accreditation, but then the school will issue only its own certificate. If the university wants to have accreditation of the educational program, it should inform about it. We are planning to create such an electronic resource, where this HEI will be registered and will add relevant information about itself. Our experts will study it first and on the basis of this, further cooperation will take place. Then the expert group visits the university, works there according to a certain procedure and forms its conclusions. It is important for us that teachers immediately feel the practical benefits and help from the Agency. That is, you will have to recruit the necessary number of experts because there are many universities in Ukraine? Yes, I would say that there are too many, and still we need to figure out what quality of services they all provide. Since at one time, licenses were distributed to anyone who wanted, and universities in the 90s of the last century appeared even in the premises of apartments and kindergartens. Therefore, we will first hold open expert contests, organize appropriate training and certification. This is a lot of work. And the accreditation itself will be of different degrees from excellent to unsatisfactory. There are also several transitional steps when it will be possible to eliminate the identified shortcomings or respond to the advice received. The presence of a certain number of educational programs that are accredited as “excellent” will give the HEI an opportunity in the long term to carry out such accreditation by itself. However, all this will not be so simple. The requirements will be serious, many of them ‒ completely new. For example, the presence of an internal quality assurance system for education.How do you plan to cooperate with the Ministry of Education? On the basis of equal partnership. And this fruitful cooperation is already there. It is important that the Ministry has the right of legislative initiative; therefore, it can initiate the creation of the necessary regulatory framework. For example, if we are talking about documents that should be taken at the level of Government decisions and decrees, or amending existing laws, then it is the Ministry of Education and Science that initiates it. It is important that licensing remains the option of the Ministry. Therefore, we are already coordinating the various requirements so that they correlate with late accreditation. How will the National Agency be funded, because without money, any, even the best intentions can remain at the level of ideas? I hope that over time there will be as much money as necessary, but for now, we are funded only from the state budget. For this year only the minimum is budgeted ‒ only for salaries. We also have the right to have a special fund connected directly with our activities. We work with donors. That is, universities will pay some money for the accreditation? Do you have some premises already? The agency had to work back in 2015, and then I “banned” it because of violations during the election. Then there was another attempt to launch it in 2016, at the same time the secretariat of the agency was created and the premises were allocated at the following address: 1 Borys Grinchenko St. Though, most likely, some of our units will be located at other addresses. The people, you plan to work with, are all new? In principle, yes. But, as it turned out, the secretariat has been employing some employees for a long time already. That is, we have such a strange situation: the secretariat was created to serve the National Agency, but the agency itself did not work until the beginning of 2019. So I wonder, what the people, who worked in the secretariat, did? When it comes to technical staff, this is understandable: any legal entity must have, for example, a chief accountant or a person responsible for staffing. And what about the rest? As soon as I was appointed and we came here, these weird people first went on vacation, now they are hiding, having a sick leave. I wonder how long they will do it. After all, the too long period of a sick leave eventually turns into a need for a transition to a disability.Are there a lot of such employees in a secretariat? Well, there are at least five of those (on vacations and on sick leave there are four of them now), whom I definitely wanted to ask what they did. This is generally similar to some kind of scheme, when people, without doing anything, for a long time received state salaries. And the former acting head of the secretariat even voluntarily registered himself in the Unified State Register as chairman of the NAHEQA. It, obviously, suited other employees. As well as the fact that in the dissertation of their leader in 2016, 80% of the plagiarism was detected. Now they have all joined together and in their free time they are suing the National Agency, trying to prevent our activities. Apparently, in order to extend the period of their fictitious employment, because they are only “registered” there. These fun facts determine the circumstances in which we have to start our work. Are the people, who started working with you a real team, or those, who happened to be in the same boat? Of course, we are talking about a new team. First of all, this is the entire composition of the agency, which includes well-known experts, representatives of various stakeholders, selected by a specially created international commission. We are all different, with excellent professional experience, we are interested in working together. Then, the entire team elected a chairman, that is, me, and four of my deputies working at full employment: Ivan Nazarov, Andrii Butenko, Olena Yeremenko, and Natalya Stukalo. We also have the head of the secretariat, elected by the Agency. 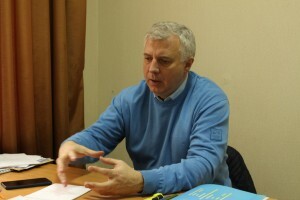 This is Mykhailo Vinnytskyi, who was also active in the working group of the draft law “On Higher Education” in 2012-2013. New people are gradually joining the secretariat. This is really a completely new and real team. One of the NAHEQA areas of work is the creation of a National University Ranking. What are the selection criteria here? So far, these criteria have not yet been formed, but they are not too different from those rated by universities in the world. Obligatory components, without which we cannot do, are objective indicators, related to academic achievements, graduates, the results of the scientific activity, the level of student self-government, the existence of a system of internal quality assurance, compliance with the stated mission. Yes, this academy did it first. This includes many components, for example, a regular online survey of students (before each session), a survey of graduates and employers, the professional development of teachers, etc. In fact, we are talking about the whole algorithm, how the university reviews and improves its educational programs, training courses, how it follows the principles of academic virtue. It all comes down to having a unique inner culture, which makes such approaches. The activities of the Agency are also associated with the fight against plagiarism. Is it real to put a reliable barrier for plagiarism? Plagiarism is one of the violations of academic virtue. This is also a matter of internal academic culture. The effectiveness of this struggle is not measured by how to catch the hand, but primarily how to change the culture itself, the approaches to solving the problem. You need to start at school here, and to continue in universities. When first-year students come ‒ they should immediately be brought into the appropriate codes of honor, taught what academic writing is, what plagiarism is, and how it should be avoided.At the same time, there are many means, including technical ones, how plagiarism can be determined. Relevant policies and procedures, both on accreditation and on academic virtue, will soon be formulated by our agency and they will be available online. There have already been scandals associated with the detection of plagiarism in dissertations. Would you check the research papers that have been written a long time ago? Here you need to answer a number of questions: since when is it possible to receive complaints of plagiarism? How can they be given? How do we identify plagiarism? It is also important how the university relates to the writing of term papers and dissertations by its students. Is it complying with all the necessary procedures, taking proper care of its internal culture? By the way, all members of the Agency, secretariat staff, and experts, who cooperate with us, will sign a special declaration of academic virtue. The virtue of the people, who work here and with whom we deal is also an important qualifying characteristic. Recently in Kharkiv there was an on-site meeting of the Verkhovna Rada Committee on Science and Education, in which you participated. In particular, at this meeting, they discussed the need to create a National Electronic Information Resource for Employment. Will the Agency, which also includes employers, participate in this process? Yes, this is a very important area, since the needs of the labor market often do not coincide with the number of specialists in various fields, who are trained in the national education system. Employers, who are part of the structure of the National Agency, and we have three of them, are very active. They will participate in the organization of the educational process, and we will respond to their needs and demands. Such cooperation is one of the main tasks of the NAHEQA. Any law needs to be developed because life is constantly making some adjustments. Take for example the question of the Agency itself: we laid the idea in 2012, but then it did not occur to anyone to properly prescribe the election procedure and requirements for the agency members, so there were problems with its formation. Then we took care of protecting universities from the arbitrariness of the Ministry of Education and Science, but after that, the situation changed radically. Therefore, later amendments were made to the Law “On Higher Education” in the part of NAHEQA. Now both the requirements for its members and the election procedure are spelled out quite clearly. There are also a number of other provisions that need to be changed at the request of life. I do not see anything terrible in this. But this bill deals with giving almost unlimited powers to supervisory boards. If it is adopted in this form, would not it harm the higher education system as a whole? Such offers really look unrealistic. Like ideas about limiting the age of the rector. This is not serious. I will explain why. If we want the representatives of the new generation to come to the positions of rector with new thinking, better training, knowledge of foreign languages and management practices, for this we first need to change the economy of higher education. The law that we have now is very progressive. Its main concept is comprehensive university autonomy, which contains academic, financial and organizational autonomy. Academic autonomy in Ukrainian universities, as in any Western, has already been fully introduced. And they can show their uniqueness in the market of educational services, become more competitive. The problem is that our HEI cannot capitalize on their achievements because they do not have financial autonomy. Academic autonomy in such conditions is often perceived not as the discovery of new opportunities, but as new problems. Financial autonomy primarily involves changing the economy of higher education. The respectable age of a significant number of rectors is not a cause, but a consequence of a problem. Ukrainian universities are led by people, who know the system and deal with important challenges. If we want to update the rector’s corps, we need not discriminate managers by age, but to change the system itself, that is, the economy of higher education.Is it somehow related to the state order? Yes, we need to refuse the state order and introduce basic funding for those HEI that meet certain quality criteria. For those, who receive basic funding, other sources of financial resources should be available. After all, national interests are in the quality of graduates and the quality of scientific research, so that the university can truly become a business entity. Interfering with operational processes makes no sense. These economic changes are very important. Our agency can help implement them because we will define quality criteria, operate with statistics, and prepare annual reports. It is also necessary to change the economy of higher education because the state needs to develop the industry and spend money efficiently. And what about the empowerment of supervisory boards, how can it help here? No way yet. Our supervisory board cannot have such powers as, for example, in the United States. There, the ward of trustees may at any time make radical decisions, for example, remove the rector and appoint another person. Because in the USA, the supervisory board brings all the resources to the university. And in Ukrainian universities, resources are predominantly state-based, since the majority of higher educational institutions, including the most qualitative ones, have state ownership. Unfortunately, private HEI do not yet constitute proper competition. The supervisory board cannot take any responsible decisions, related to funds and property: in Ukraine, as in the post-Soviet country, the rector is personally responsible. Changing the economy of higher education, in its turn, will affect the understanding of management leadership: if in Ukraine it is still associated with the charismatic features of the sole leader, then in the West, leadership is a command concept. All members of the university community must provide leadership within their area of responsibility. Only when Ukrainian universities will gain financial independence, when more sources of funding appear, only then the supervisory board will have more influence. In the meantime, it cannot have such weight as in the West, where everything works differently. But if you refuse the state order, then where to get these other sources of funding? Here we must understand that the rejection of the state order and the introduction of financial autonomy do not mean a rejection of state funding for universities in general. I am more impressed by the British experience here. On the contrary, the state should finance universities, in particular, in the part of scientific research, in significantly larger volumes than it is doing now. It is about the effective use of state funds, encouraging initiative and self-government. Indeed, conceptually, university autonomy corresponds to the extremely successful Ukrainian policy of decentralization. Deepening public-private partnerships, tax incentives for private investment, the development of real market relations, with access to the international arena ‒ this is our future in terms of the development of the economy of higher education. Опубліковано у Uncategorized, Університет. Додати до закладок постійне посилання.